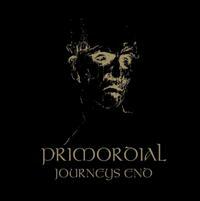 PRIMORDIAL’S music is kinda hard to describe. They are black folk metal with a progressive edge, they are depressive, emotional, dark, melancholic yet aggressive and unique. Genre fans will probably wet themselves in excitement when the listen to this album and it certainly wins a little with every spin, however I miss something. It’s music for a certain mood and I sadly miss the memorable effect. Track 2 “Dark Song” is the highlight for me. It’s a dark and melancholic almost acoustic track that really did something for me. I found myself drifting away and suddenly I was one with the music. There are certainly parts in the other songs that I enjoy... but some songs just seem to go on and on and on. Well... it takes repeated listens for this album to sink in but even after numerous listens I’m still a bitconfused and lost somewhere between heaven and hell. The live CD is certainly for fans only... because the production is Horrible... and I mean horrible! The sound is distorted and noisy and I couldn’t stand to listen to it more than one single time. To sum it all up; If you’re into atmospheric dark metal then you should definitely give this band a listen or 2.